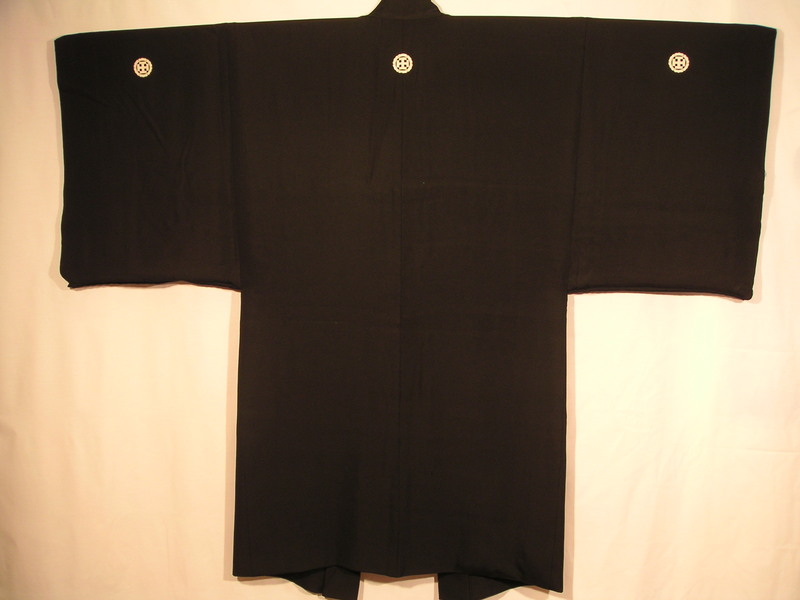 This is an excellent example of a Japanese Man’s “Haori” or formal topcoat. 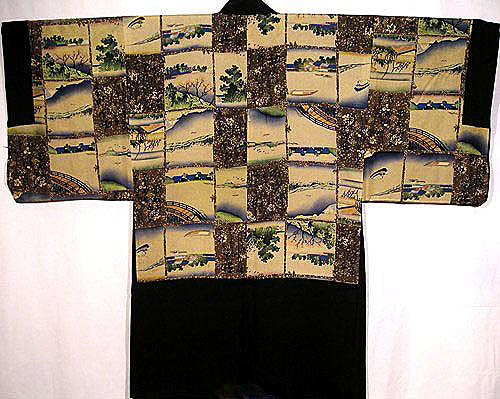 It is entirely handmade, totally reversible, and has represented the height of formal ware for Japanese men for centuries. 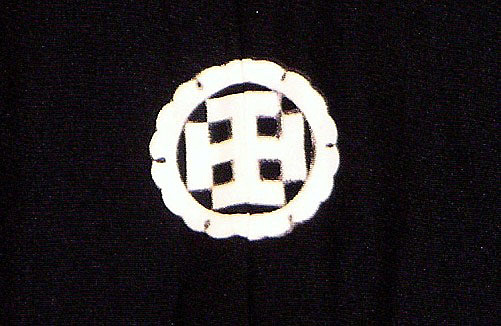 The outer layer of the garment is a high quality, solid black Satin Silk with the exception of 5 white circles within which a pictorial symbol of the family crest or “Mon” has been painted. The crest is a very dramatic and strong representation of the Cross (“Kurusu”), except that this version of the Cross has been disguised by its inclusion of additional cross bars and a very highly stylized circle enclosure. As early as the 16th Century, there were as many as half a million Japanese converts to Christianity throughout all strata of society. However, after several celebrated Christian uprisings, Christianity was banned throughout the country by 1630.. This anathema towards Christian converts continued even after the Meiji Restoration (1868); and, although they were no longer executed, it required a very strong individual to use any form of this symbol as a Family Crest. 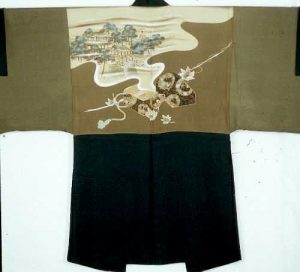 However, what makes the Haori for men so intriguing is the fact that the main source of decoration is on the inside of the garment (shown upper left), or the lining. 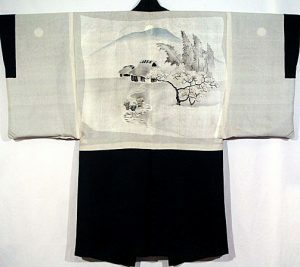 The inner lining of this spectacular Haori has been hand stenciled, using natural dyes, in the labor intensive “Rice Paste Resist” technique. 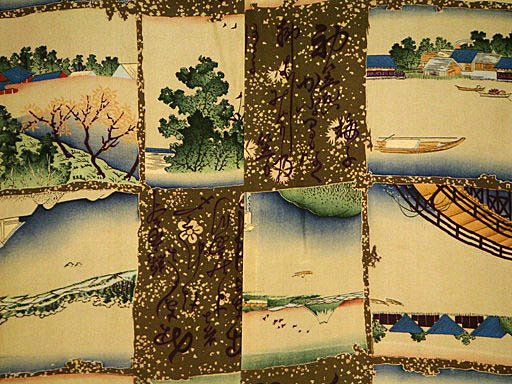 Stencils, in Japan, were works of art in themselves. The stencils were hand made layers of mulberry paper treated with persimmon tannin through which elaborate pictorial images were created. 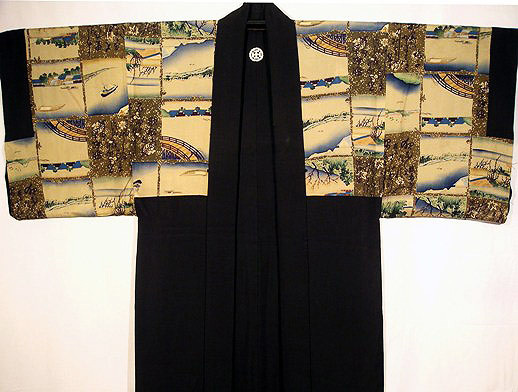 On this Haori, the design has been expanded to extend all around the interior of the garment, which is quite unusual. It is comprised of individual blocks representing landscape scenes interspersed with calligraphic images. The more intricate the design, as in this example, the greater the skill of the artist. 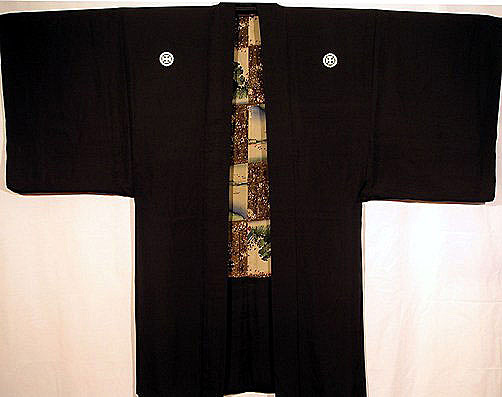 Together, this indicates that only a man of great character, wealth and status would have worn this Haori. 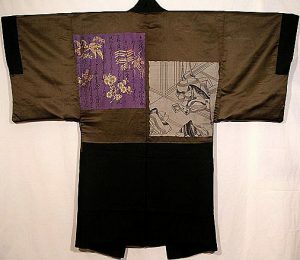 Lustrous hand woven Silk Haori hand stenciled in the Rice Paste Resist technique which requires that each individual color is painted in separately. After each color the fabric is soaked numerous times to remove the paste, before applying the next color. In excellent condition. 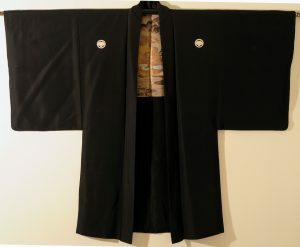 Larger and longer than the typical Japanese Man's Haori from the 1800s. To hand as a display or work of art, or to wear (perhaps with the inside panel on the outside) for a stunning and unusual full Silk Coat.